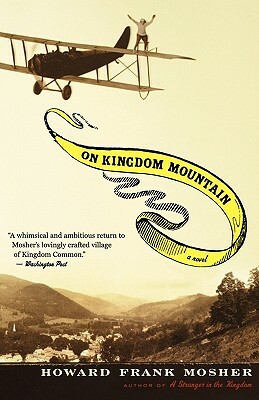 Set in northern Vermont in 1930, On Kingdom Mountain is the story of Miss Jane Hubbell Kinneson. She is a renowned local bookwoman, eccentric bird carver, and the last remaining resident of a wild mountain on the U.S.-Canadian border, now threatened by a proposed new highway. Miss Jane encounters a mysterious stunt pilot and weathermaker when his biplane crashes on a nearby frozen lake. He brings with him a riddle containing clues to the whereabouts of stolen Civil War gold that may have been hidden on Miss Jane’s property. As she and the footloose aviator search for the treasure, Miss Jane is confronted by the most important decisions of her life. Featuring daring action scenes and outrageous comedy, along with a passionate, surprising love affair, On Kingdom Mountain is traditional storytelling at its best, rooted in Howard Mosher’s own family history and in a way of life on the brink of extinction. HOWARD FRANK MOSHER is the author of ten books, including Waiting for Teddy Williams, The True Account, and A Stranger in the Kingdom, which, along with Disappearances, was corecipient of the New England Book Award for fiction. He lives in Vermont.